*This post contains affiliate links. For more information, please visit my Disclaimer page. I really love picking out Christmas cards. There's something about creating something so personal to send to your loved ones that I absolutely love! I try to stay the more traditional route because red and green are...well, the colors I grew up associating with Christmas, but lately I've come to adore anything with a more modern flair. 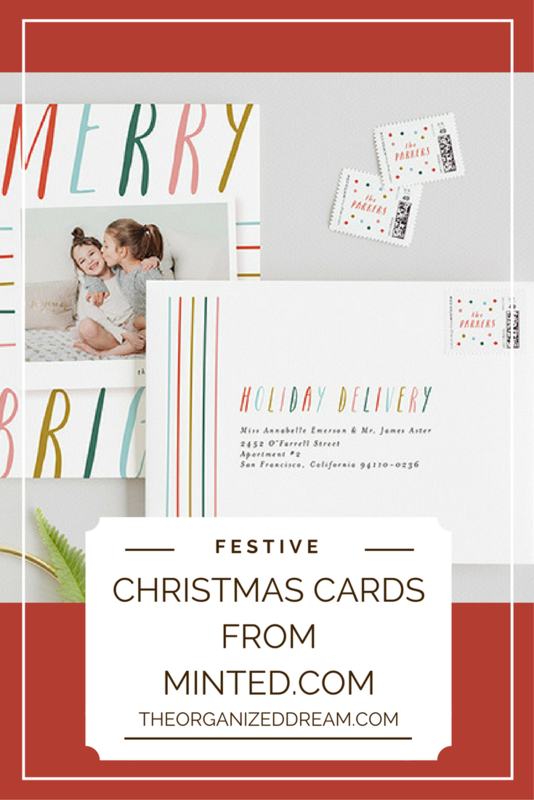 I've gotten Christmas cards in the past from Minted.com and, let me tell you, I loved, loved, loved them! Minted.com has a wide range of Christmas cards to choose from and I really do believe that there is something for absolutely everyone's taste. If you're not like me and gravitate towards those red and green shades, this card is for you! I love that this card has a rainbow of colors and creates such a happy and cheerful feeling when you look at it. 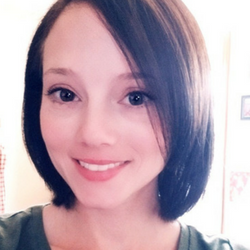 It also works splendidly with a black and white photo because there is plenty of color already to make your precious photo pop. They have many other cards featuring unconventional Christmas colors, but this big and cheery card was my favorite. I have an obsession with buffalo plaid...maybe it's a little too much of an obsession to be honest. I fell in love with the way I've seen it used in home decorating and have even incorporated it into my decor. The black and red check design is so classic and homey to me that I don't think I could opt not to use this pretty little buffalo plaid card here in this post. It has just the right amount of the pattern to offer that warm and cozy feeling to your card and still stays modern and tasteful. I mean, honestly, it's a pretty great card, right? A few years ago my mother decided that she was going to punch a hole into the Christmas card I sent her with my daughter's picture on it. She strung it on a piece or ribbon and has put it on her tree ever since. 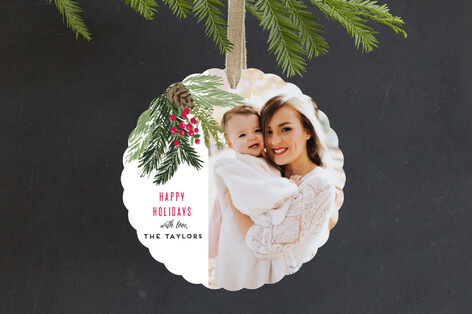 I feel like ornament cards are one of the best options for a Christmas card because it has more meaning hung on a tree than on a fridge and can be hung every year after as a momento. This foliage cornered ornament card is pretty darn perfect. I'm very sentimental when it comes to Christmas and like to wear my heart on my sleeve when creating them for my family. There are some members that I don't see very often and creating the perfect Christmas card is my way of sending my utmost love to them at this time of the year. 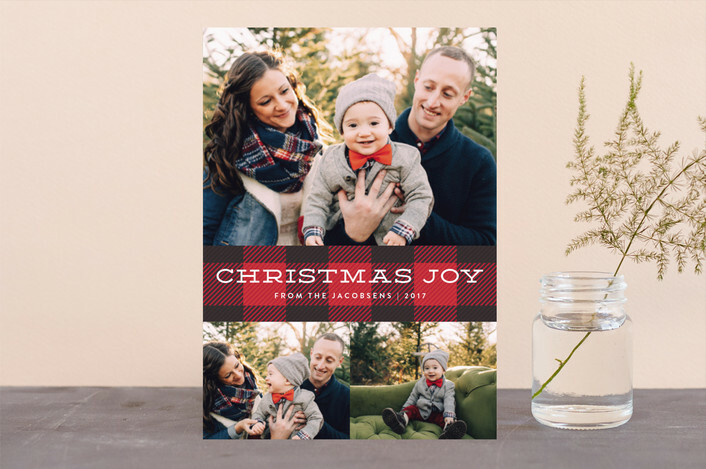 I was completely and utterly satisfied with my cards from Minted.com and I think you will love them as well. 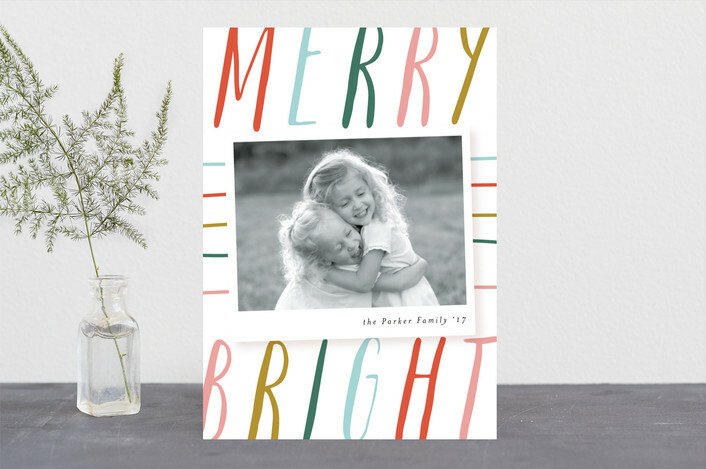 Right now you can save up to 15% on the purchase of your Holiday Cards including Ornament Holiday Cards. 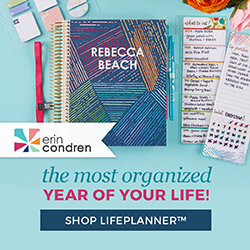 You can also take advantage of their free envelope and address label offer! How cool is that? !